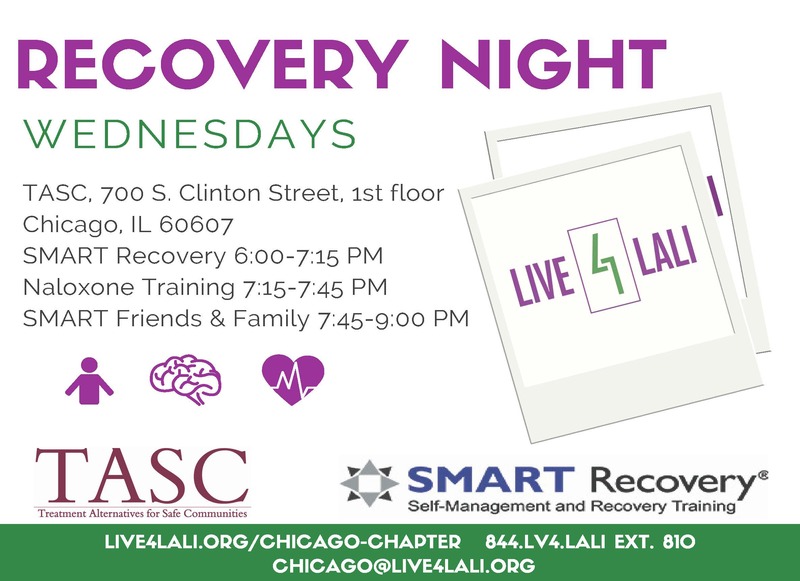 (Chicago, IL) – Motivated by the devastating impacts of the growing addiction and overdose epidemic, Live4Lali will provide recovery education, support, and harm-reduction services in Chicago every Wednesday night beginning September 27. Live4Lali has teamed up with TASC (Treatment Alternatives for Safe Communities) to offer these weekly services at TASC’s office at 700 S. Clinton Street. Last year, a total of 1,091 people in Cook County died, at least in part because of an opioid-related overdose, which is up from 649 in 2015. According to Roosevelt University’s Illinois Consortium on Drug Policy, the Chicago Metropolitan Area ranks highest for both emergency department mentions for heroin and number of individuals who were arrested and tested positive for heroin. “Stigma surrounding substance use and overdose has fueled this epidemic. Stigma keeps people who struggle with substance use disorders and their families ashamed, silenced, and unsafe. By offering interventions such as relevant and accurate information, coping skills, the overdose antidote, naloxone, and linkages to care, we have seen families and communities heal and thrive,” said Live4Lali’s Cofounder and Executive Director, Chelsea Laliberte. 7:45 – 9:00 PM – SMART Recovery Friends & Family, an evidence-based peer-to-peer support group based off of the SMART Recovery modality specifically for family and friends of someone struggling with addictive behaviors. For information about recovery nights, visit Live4Lali.org/Chicago-chapter, call 844.LV4.LALI x810, or email [email protected]. Buffalo Grove, Illinois resident Alex “Lali” Laliberte died of a polysubstance overdose in 2008. His sister Chelsea and their parents, Jody Daitchman and Gary Laliberte, established Live4Lali (501c3) so that other families might not suffer the devastation of their loss. Live4Lali’s mission is to prevent and raise awareness of substance use among individuals, families, and communities, and minimize the overall health, legal and social harms associated with substance use. Live4Lali has helped pass groundbreaking state and federal legislation and offers direct, on-the-ground education, support and harm reduction services to those directly impacted by addiction or overdose. Visit Live4Lali at Live4Lali.org, on its social media platforms, or for more information call 844.LV4.LALI. TASC, Inc. works in partnership with justice systems, child welfare programs, and community-based organizations to build connections to recovery for people with substance use and mental health issues. By providing case management, outpatient treatment, and other direct services for approximately 20,000 Illinoisans annually, as well as consultation and training services nationally, TASC helps to increase health, reduce recidivism, and support recovery.